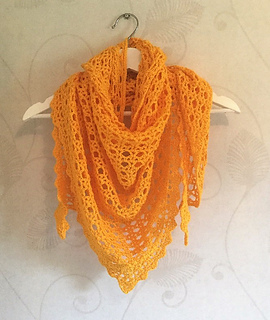 Treasure Net is a triangular lacy shawl that is worked from the bottom up. 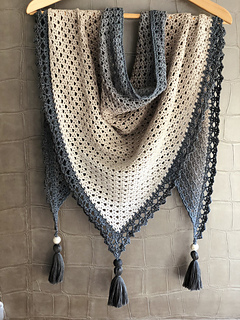 After row 7 you repeat row 6-7 until the shawl has the size you want and then you crochet the edge. 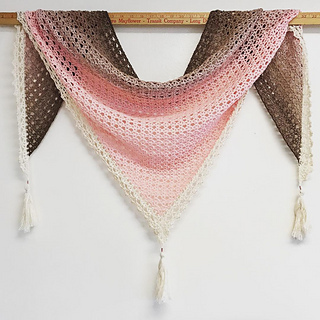 This means that you can use this pattern with any yarn and hook size and very easy adjust the number of rows to give the shawl the size you like. Written pattern in English (US terms), Swedish, Danish, German, Spanish, French, Italian, Dutch, Polish, Slovak and Portuguese. Many pictures to visualise each typ of row in the pattern. 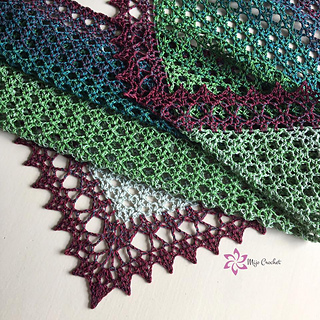 You can find more information about specific amounts of yarn, alternative yarn suggestions and hook sizes on my blog. My Facebook group Mijo Crochet Hangout is a social group where you can get support and be inspired by other fellow crocheters. Welcome! 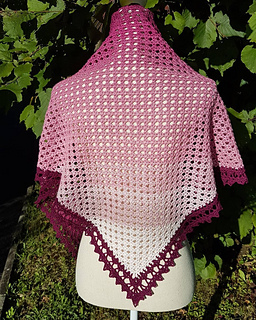 This pattern have been fully tested, thank you Jessica Wittemyr and Anna Nilsson for your work. Copyright Mijo Crochet 2018. Reproduction and publication of pictures and/or pattern is not allowed. Commercial use is not allowed without the designer’s written consent.